Step 1. Preheat the oven to 350 degrees Fahrenheit. Line the baking tray with parchment paper. Step 3. Begin your wet bowl by creaming the butter, both sugars, and honey in the other bowl. Make sure the butter has softened. You can do this step with an electric mixer, but the butter should be soft enough that a spoon will work well too. Step 4. Add the vanilla and eggs to the butter mixture, beating until completely mixed. Step 5. Pour in a quarter of the wet bowl into the dry bowl and mix, making sure you are getting at the flour from the edges. Add the next quarter and mix again. Repeat until all the wet mixture has been completely added to the dry. Do not over-stir the batter! Step 6. Fold in the ginger, apricots, macadamia nuts, and white chocolate, keeping in mind that the batter is plenty stirred at this point, and all you are doing is dispersing these ingredients. Step 7. Roll dough balls with your hands that are approximately 2 Tablespoons. An ice cream scoop works well for this step too. Step 8a. Spray the parchment paper with cooking spray and place six cookie dough balls onto the tray, leaving several inches between each one. Bake in the oven for 12-20 minutes, depending on your ovenâ€™s strength. Youâ€™ll know they’re done when the tops firm and brown slightly. Step 8b. For an extra soft cookie, my favorite, chill the batter for at least an hour in the freezer. Then set six pieces on the sprayed baking sheet and place in the oven. Depending on your oven and how long you set these in the freezer, cookies need to bake between 12-25 minutes (I know 25 seems like a long time in cookie world, but trust me). Remove when tops firm and brown. Step 9. 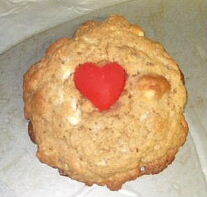 Gently insert your candy hearts on top of the cookie. I had leftover Jube Jels so I used those, but conversation hearts or another non-chocolate candy should work too (chocolate ones would melt from the heat of the cookie). Step 10. Let the cookies cool on a wire rack. Eat immediately or store in an air-tight container. These cookies encompass many of the things I love about candy and food. I only make them for people I care about and want to spend the time, effort, and money on (yes, money – Macadamia nuts are not the cheapest thing in the supermarket!). Hopefully thereâ€™s a special someone in your life you can share these cookies with. 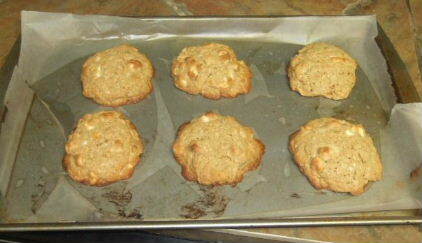 But if not, nothing wrong with telling yourself how much you think you rock with a batch of cookies all for you. Happy cookie Valentine’s Day! These cookies sound fabulous! Am going to try making them when I feel ambitious.